Winter is here. Blizzards, ice storms, and high winds can all cause power lines to go down and backup generators to kick in. When that happens, you need to know that your generator is going to work as expected, which means putting in some prep work ahead of time. Cold weather can cause sluggish batteries, thicker oil, and slow-moving parts – all of which can cause engine strain. We hope you follow the manufacturer’s recommended cold weather procedures and perform basic maintenance year-round, but we especially recommend taking these precautions before the cold hits. Take some time in the late fall to change the oil and filter, check the spark plugs, fluid levels, and batteries. That said, here are a few more things you can to do help ensure your backup generator works when you need it to. Test your generator in winter conditions to see how it operates and if there are any start-up problems. You might want to run more tests in winter to keep the parts lubricated and identify any areas of concern. Be sure to test any digital controls once the temps hit single digits; subzero temperatures have been known to wreck havoc on digital control panels, preventing them from even turning on. Once temperatures dip make sure your engine block heater is plugged in and functioning. Without this important piece of equipment keeping the engine and liquids even slightly warm, the machine may not start at all. Dead batteries are a leading cause of generator service calls. Make sure your battery charger is plugged in and connected to prevent batteries from losing too much power due to cold temperatures. It’s a good idea to treat the fuel in the tank with anti-gel and anti-microbial additives to help ensure it is usable when the time comes. A visual inspection should be part of general generator maintenance and you should keep that up in winter. Make sure the area around the generator is clear of debris. Look for leaks, staining, and puddles, which can indicate a broken component. Check the exhaust and ventilation for blockages. 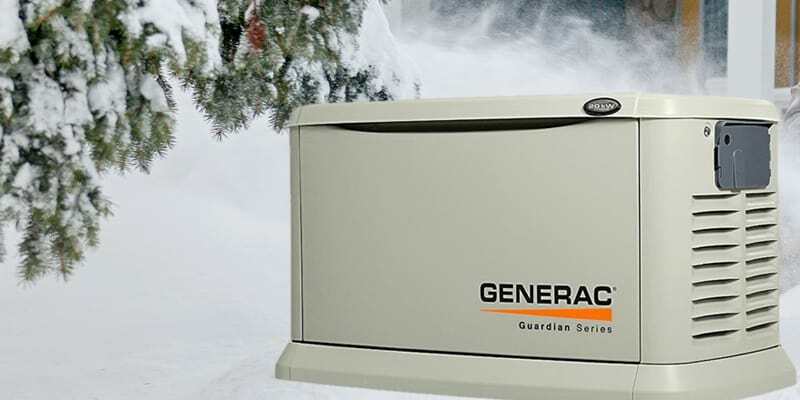 Winter prep can help ensure that your generator starts without having to wait through a lengthy warm up period and can reduce the chances of the generator failing in cold weather conditions. If your generator has seen better days and you aren’t sure any amount of winter prep work is going to ensure its operation this winter, Robison today.